It’s no secret that the fun in playing Grand Theft Auto titles is more than just completing the game’s narrative. Gamers enjoy hanging around and exploring the open world and design, shooting and blowing things up along the way. And like sport of basketball before it, where a whole separate game of H-O-R-S-E was developed to accommodate the action of developing trick shots and asking competitors to repeat them, trick shots in Grand Theft Auto V have become a reality. It’s the natural result of spending too much time making cars explode. 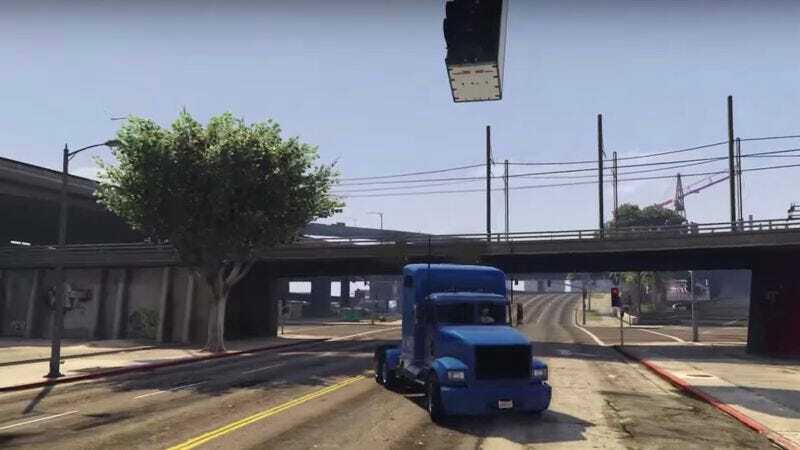 One player known as Blacksmoke Billy has developed a particularly impressive move when driving a semi-truck trailer. By throwing C-4 on the ground and driving over it to blow the trailer off the truck, Billy attempts to land in a matter that reconnects the truck and the trailer back together. Once perfecting this move, Billy took it the next step and started employing bridges into his routine, creating a pretty impressive display in both imagination and time killing. If GTA V H-O-R-S-E becomes a thing, Billy will be hard to beat.